PLANETS Charitable Fund are excited to have joined forces with Pancreatic Cancer UK to provide a grant over a two year period for a pancreatic research project: ́The role of Eps8 in αvβ6-dependent functions in pancreatic cancer invasion’ to be undertaken by Dr Jo Tod. Jo Tod graduated from Imperial College School of Medicine, London, in 2004 with MBBS Honours and a 1st class BSc. She undertook her Core Medical Training in Southampton before acquiring a National Training Number in Gastroenterology and Hepatology, and is currently in her third year as a Specialist Registrar. University Hospital Southampton is a national centre for pancreatic diseases and whilst training there Jo developed an interest in pancreatic cancer. 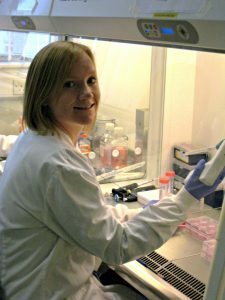 In 2011 she was awarded an MRC Clinical Training Fellowship to undertake a PhD studying molecular mechanisms of invasion in pancreatic cancer (PC) under the supervision of Prof Gareth Thomas and Dr David Fine. Jo has established a strong research foundation in pancreatic cancer. In addition to her PhD work she has generated a pancreatic tissue bank, and is leading a multi-centre European Pancreas2000 project to examine the tumour biology of long survivors of PC, for which she was awarded a Future Leaders Award from Pancreatic Cancer UK (£10,000). Her PhD was awarded in 2014 and her results have been presented at local, national and international conferences and have won several prizes and awards. Manuscripts for this work are being prepared for publication. 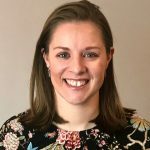 Jo has recently been appointed as an Academic Clinical Lecturer at the University of Southampton, a post that allows her to continue building on this platform of pancreatic research whilst completing her clinical training to become a consultant. In September 2014 she was awarded a Medical Research Grant from Grant Charity/Pancreatic Cancer UK (£47,000) to fund ongoing investigations into mechanisms of PC invasion. Jo’s ultimate aim is to obtain a Clinician Scientist Fellowship in order to run her own lab-based research team, addressing important clinical problems, combined with clinical practice. Pancreatic adenocarcinoma (PC) has one of the worst outcomes of any cancer; only 3.7% of patients survive for more than 5 years. Patients usually present with advanced disease, less than 20% of patients are suitable for surgical treatment, mainly because at the time of diagnosis the tumour has already spread into adjacent tissues, making surgery impossible. It is clear that in order to improve outcomes of this disease new molecular-based treatments and methods to improve early diagnosis are required. Outlined below are my current research projects. The spread of malignant cells locally (tumour invasion) is fundamental to cancer development and progression. Integrins are a family of cell surface receptor proteins that play a variety of roles in cancer. The integrin avb6 is not found on healthy cells but is upregulated in cancer. We and others have found that high levels of avb6 are seen in more than 70% of PCs and that avb6 can promote tumour invasion directly by increasing cell movement and indirectly by activating a signalling protein called TGF-b. TGF-b is critical to the formation of the characteristic fibrous supporting tissue surrounding the cancer cells which is known to promote tumour progression. We have identified a novel link between avb6 and the protein Eps8. Eps8 is also upregulated in more than 70% PCs and plays a role of changing cell shape allowing cells to move and invade. We have found that a high level of Eps8 promotes avb6-dependent cell movement, yet inhibition of Eps8 promotes avb6-dependent TGF-b activation. avb6 is an exciting potential target for PC therapies however the activation of TGF-b by avb6 can have both positive and negative effects on PC progression. It is essential therefore that we understand the mechanisms underlying these critical functions of avb6, and Eps8 warrants further investigation as a potential molecular switch controlling these functions in PC. Understanding this process will give crucial insight into the biology of tumour cell invasion, and may uncover novel targets for the treatment of PC. In order to improve the outcome of pancreatic cancer it is imperative that we gain a better understanding of the underlying tumour biology. The majority of published studies focus on features of the tumour associated with poor outcome, however what we think is more fascinating is the tumour biology of patients who had a good outcome and long survival – these patients may hold clues to potential mechanisms that prevent more aggressive disease. Our study is a multi-centre European study developed within the Pancreas2000 program (http://pancreas2000.org/) – a program designed to promote research collaborations between young researchers and doctors throughout Europe with an interest in the Pancreas. I am the team leader for the study with a team of young researchers from Germany, Poland, Finland, Italy, Netherlands, and Hungary. Our study aims to identify a large cohort of patients from across Europe with long survival following surgery for pancreatic cancer. We are in the process of investigating the tumours of these patients to identify biological markers associated with good outcome. We are partway through this project and making good progress. We have also established collaborations with Oxford Gene Technology in order to undertake genetic sequencing of a cohort of long and short survivors; the findings from which I hope will provide preliminary data for a future grant application. We hope that this study will identify markers that will give us a greater knowledge of the disease, and provide insights that will allow development of more targeted therapies for pancreatic cancer. The formation of a young enthusiastic Pancreas2000 collaborative team will also be a fantastic resource for further multi-centre studies and the future of pancreatic cancer research. Since 2010 we have been approaching and recruiting all patients undergoing pancreatic resection at University Hospital Southampton. Ethical approval is in place and with appropriate patient consent we collect blood, fresh pancreatic tissue at the time of surgery and paraffin-embedded pancreatic tissue in order to generate a tissue bank of pancreatic diseases. To date 134 patients have been recruited with a range of underlying pancreatic diseases. In collaboration with Professor Nick Cross, Director of the Wessex Regional Genetics Lab, we are currently using these samples to test the feasibility of detecting genetic mutations (changes in the genetic material of the cell) from pancreatic cancer cells in the blood. Initially we have confirmed we are able to detect genetic mutations in pancreatic cancer tissue and also shown that these mutations are not present in non-cancerous pancreas e.g. chronic pancreatitis samples. We are currently trying to optimise the detection of these same mutations, which are found at much lower levels, in the blood as this could potentially provide a possible future method to diagnosis and monitor pancreatic cancer. This tissue bank will provide a fantastic ongoing resource for pancreatic research of both benign and malignant diseases. New treatment options for pancreatic cancer and methods of early diagnosis are desperately needed. University Hospital Southampton (UHS) is a tertiary centre for pancreatic disease and is a Nationally recognised Pancreatic Centre. Additionally we have the Cancer Sciences Unit and the Cancer Research UK Centre and hence UHS is a fantastic place to drive pancreatic cancer research forward.